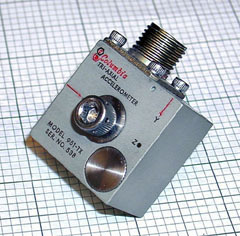 The 951-TX Triaxial Piezoelectric Accelerometer was designed to be an integral part of a computer-controlled vibration analysis system. The high and low frequency response of the unit is controlled with ultrahigh input impedance and low pass filters to provide broadband use. The internal electrical and mechanical isolation of the transducer elements eliminates some of the more common problems associated with transducers of this type. Stable bias voltage over the temperature range provides a constant full scale dynamic range of more than +/- 500 g's with power supplies as low as 18 vdc. Consult the factory for customized versions of this sensor. With Connector Protected or Sealed, Unit is Epoxy Sealed.